One of the most notable treks in the Sikkim Himalayan region, the Singalila Ridge and Goecha La trek finds a mention in every trekker's diary. From the vast tea gardens of North Bengal rolling down the hills to the eco – friendly environment of Sikkim, which is embellished with varied species of alpine trees, medicinal plants, wildlife and avifauna at different altitude, the journey simply woos the travellers. Ideally the trekking tour from the crest of North Bengal to the base of Kanchenjunga is a perfect hop for nature lovers. Further, the 360 degree view of the Himalayan range, from the hulking high peaks of Greater Himalaya that forms a silver horizon parallel to the blue sky on a clear day, enriches the moderate to challenging trail from the Singalila Ridge to Goecha La. 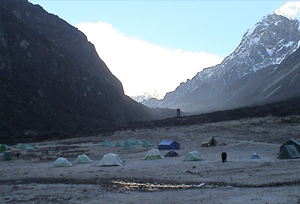 The Singalila Ridge and Goecha La Trek also takes you to the deep and diverse culture of Sikkim. Tucked in the mountains, Sikkim boasts of several monasteries that dilate a diorama of the footsteps of Buddhism in Sikkim. 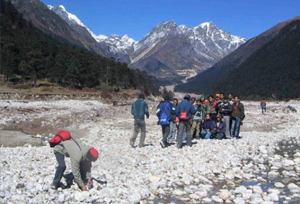 The journey cuts through several tribal villages that belong to the Lepchas, Nepalis and Bhutias. During the festive seasons, you can even experience the vibrancy of festivals like Drupka Teshi, Losar, Bumchu, Losoong, Saga dawa and more. Not to forget the harmony and ethnicity of the people. You will never forget the colourful appearance of the Lamas wearing a festive mood. That's the best part of the trek, if only you hit the tracks during April and May and in October and November. The trek from Singalila Ridge in North Bengal to Goecha La via Dzongri commences from Tonglu, which is at an altitude of 3,070 meters, via Maneybhanjang from Darjeeling. From Tonglu one can spend some ideal hours, just treating their eyes to the rejuvenating sight of the lush green Himalayan ranges below the silver lining of the clouds. From Tonglu the route snakes through the vast forest of rhododendrons to Garibas, which is at an altitude of 2,620 meters, and thereafter there is a gradual climb to Sandakphu at 3,640 meters en route to Singalila National Park and Kalipokhri. 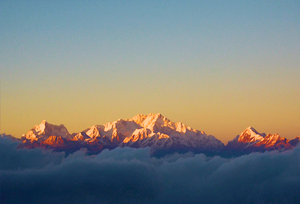 From Sandakphu one can fest his eyes on the aureate sunrise over the Himalayan range unfolding the summits of Kanchenjunga, Jannu, Everest, Lhotse, Makalu and Cho Oyo. From Sandakphu the trail continues to Phalut and thereafter the trail downhill takes you to Rimbik via Raman. From Raman the journey wheels to Yuksom via Pelling and Pemayangtse Monastery. 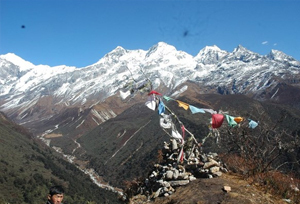 Yuksom is the gateway to the Goecha La that traverses through Dzongri. The trail from Yuksom passes through the rich alpine forest and cuts through several tribal villages to Tshoka at 3,030 meters. The difficulty level starts from here when the trail goes through gradual climb to Dzongri at 4,020 meters and thence leads to Samiti Lake at 4,200 meters via Thangsing. From Samiti Lake, another steep climb leads off at Goecha La at 4,940 meters. The downhill trail follows the same route to Yuksom and thereafter wheels to Gangtok. Where you will be met and transferred to your hotel. A Full day sightseeing tour of Delhi. Overnight at Hotel. 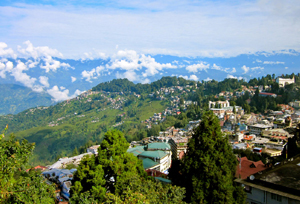 Day 03: Delhi - Bagdogra (by plane) - Darjeeling (2130m) by car. Departure transfer to the domestic airport for the flight Bagdogra and on arrival transfer to Darjeeling. At first we drive through flat rice field and tea plantation, before the road ascends to the foothill of the Himalayan. We drive through more tea plantation, where the famous Darjeeling teas are grown. The main attraction is the steam toy train whose track zig zags through the main road all the way to Darjeeling just crossing over Ghoom at an altitude of 2440 mts. 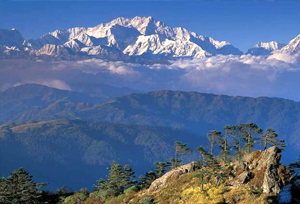 Darjeeling itself is at 2134 mts with a majestic background of the third highest peak in the world. Mt Kanchenjunga.O/n Hotel. Early wake up for the jeep rides to Tiger Hill to see the sunrise over the Kanchenjunga and Everest. On the way back to the hotel we visit Ghoom Monastery. All this is before breakfast. After breakfast we visit the Himalayan Mountaineering Institute, the Zoo and the Tibetan refugee Center. Afternoon free to relax and look around the colorful bazaars. O/n Hotel. It is a 26-Km drive to Maneybhanjang at 2134 meters, the starting place for our trek on the Singalila ridge. After an early breakfast and interesting drive into the Himalayan foothills, we set off on the first part of our walk, the relatively short, hike upto Tonglu. It is an unavoidable fact of trekking in the Himalayas that we must get up high to find the best views. Overnight at Trekker's hut/Camp. We take a mossy paved path, that snakes through a succession of forests and hamlets, giving way, from time to time, to spectacular mountain sceneries. Overnight at Trekker's hut/Camp. Day 07: Gairibas - Sandakphu (3640m) in 4h30. We steadily climb to join the ridge trail towards Kalipokhri. Afterwards we start a long and steep climb onto the Singalila ridge that leads us to Sandakphu. A remarkable 360 ° view from the top. Overnight at Trekker's hut/Camp. We walk to a prominent viewpoint for the magnificent sunrise over the Kanchenjunga, Jannu, Everest, Lhotse, Makalu and Cho Oyo. Throughout the day, there are ever-changing views: yak herds, silvery pine forests, tiny lakes ringed with grass, and the snow-capped Himalayan range in the background. Overnight at Trekker's hut/Camp. Day 09: Phalut - Raman (2560m) in 5h. Leaving Phalut, we are temporarily saying goodbye to the views of Kanchenjunga and the eastern Himalayas, as we descend for most of the day through forests of Rhododendrons and Magnolias with isolated patches of farmland to Ramam. Overnight at Trekker's hut/Camp. Downhill again today to the crossing of the Siri Khola passing through farmland and scattered villages. Then it's uphill through largely forested terrain to the village of Rimbick. Overnight at Trekker's hut / Camp. Rimbik - Pelling by car (9h). 2.5 km from Pelling, we will visit the Pemayangtse monastery. Perched at 2800m, it is one of the oldest and most impressive gompas in Sikkim. Overnight at Hotel. Day 13: Yuksom - Tsoka (3030m) in 6h. The trail leads up the Rathong valley, through thick, semi-tropical forests. Afterwards a steep climb takes us to the tiny Tibetan village of Tsoka. The landscape has now changed into pine, rhododendron and magnolia forests. 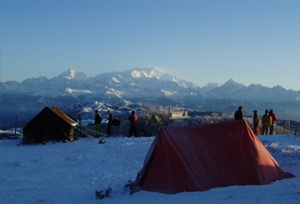 We get excellent views of the entire Himalayan range and Kanchenjunga. Day 14: Tsoka - Dzongri (4020m) in 5h. The day begins with a steep start and the trail zigzags up through the mixed temperate forest and large stands of Rhododendrons to the large clearing at phedang, where we stop for Picnic lunch. The view of Pandim, Narshing and Joponu is fantastic. Another hour and half of steep climb takes you to Deorali and a ridge walk of up and down for 45 mins. Takes you to Dzongri (13320ft), set in a natural bowl on the ridge. O/n Camping /hut. Day 15: Dzongri - Thangsing (3930m) in 4h. We descend through rhododendron forest towards the the glacial Prek river. We establish our campsite on the grassy pastures of Thangsing. The southern ridge of Kanchenjunga and the Onglakthing glacier are visible directly ahead and there are close-up views of Pandim. Day 16: Thangsing - Samity Lake (4200m) in 3h. A pleasant walk below the west side of Pandim, through dwarf azaleas and rhododendrons to Zemathang. We take our first footsteps on the Onglakthing glacier, and climb up to the shores of the Samity lake, reputed to be the sacred source of the Prek river. Ringed by prayer flags, the lake reflects Forked Peak, Kabru North, Gocha Peak and other snow-capped peaks. Day 19: Labdang - Tashiding (1740m) in 5h. Day 20: Tashiding - Martam by car (4h). We visit the Tashiding monastery, one of the most isolated in Sikkim, perched on the top of a hill set between two rivers. Day 21: Martam - Gangtok by car (1h). En route we visit Rumtek monastery, reputed for its religious Tibetan art. Visitors are welcome to attend prayers. Afternoon at leisure in Gangtok.